Slashing $100 billion: What's first to go? NEW YORK (CNNMoney.com) -- Incoming House Speaker John Boehner has made it very clear: When he takes control of the House, slashing the federal budget by $100 billion will be priority number one. Republicans point out they have already voted to ban earmarks -- money appropriated by a member of Congress for a special project -- within their own caucus. The problem is that earmarks aren't additional spending -- they're a portion of the total amount lawmakers have agreed to spend for a given year. Still, Boehner already has his starting point picked out: reducing Congress' own budget. "We'll start first by cutting our own budget. 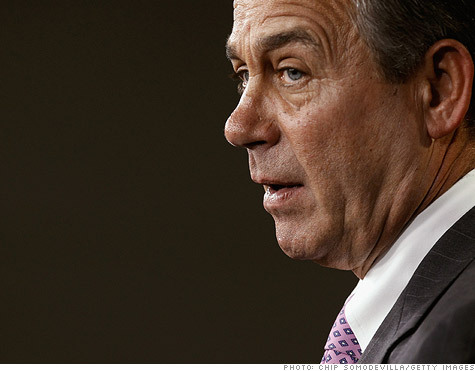 It will be one of our first votes," Boehner said earlier this month. But the savings available there are paltry. The total budget for the legislative branch was $4.7 billion in 2009. That leaves the GOP with a lot of ground to make up. Republicans offered some clues as to how they might cut discretionary spending in the party's Pledge to America document and the YouCut program introduced earlier this year. The Pledge to America is short on specifics. Among its proposals: cap discretionary spending, freeze hiring of federal workers and cancel unspent stimulus funds. "I think getting control of the discretionary accounts is a great first step," said Douglas Holtz-Eakin, a leading Republican economist and former director of the Congressional Budget Office. The YouCut program actually put some GOP ideas to the test. During the last Congress, Republicans took 14 ideas to cut the budget and brought the items to a vote in the House. If they had all passed, more than $120 billion would have been cut from the budget. Problem: Not one measure passed. It's unclear how much easier it will get. In 2011, Republicans will control the House, but they will still face a slight Democratic majority in the Senate and, of course, Obama in the White House. "The president is still the one setting the agenda," said Holtz-Eakin, president of the American Action Forum. Boehner wants to start cutting right away, saying that Republicans want to roll back discretionary spending to 2008 levels as "soon as possible." Democrats, knowing the fight was ahead, tried to nail down funding through October 2011. In the last days of the current Congress, Democrats pushed for a massive $1.1 trillion budget extension that would have locked in spending at current levels for the rest of the fiscal year, which ends on Sept. 30. But Senate Republicans killed the measure, instead forcing Democrats to settle for an extension that will keep spending at current levels until March 4. That sets up a battle royale for early next year as Republicans seek to kill signature Democratic legislative victories, some of which -- like funding for health care and financial reform -- remain unfunded. Holtz-Eakin thinks the most likely scenario is that Congress will pass another short-term fix that will fund the government until October, and that the real fight will be over the 2012 budget. "There will be some cuts [in fiscal 2011] and then they will turn to 2012, and that's where the rubber hits the road," Holtz-Eakin said.